It's an art film. It's an action film. It's a psychological drama. It uses the strong, silent antihero as the center point to an array of characters who talk, emote and display their lives. While they all show us their hopes, dreams and aspirations, our antihero remains focused on one thing and one thing only: driving. Is this Clint Eastwood in A Man With No Name? Is this tough guy Steve McQueen in Bullitt? Ryan Gosling was absolutely fabulous in the romantic comedy Crazy, Stupid, Love. (my review) This film is a complete one eighty. Instead of a character who displays the various facets of his personality and the quirks of his psyche, we have the brooding silent type, that James Dean school of temperament which gives forth an aura of seething anger, violence and darkness all bubbling below the surface of this calm, resolute, focused drive of putting one foot in front of the other. It's the person in the movie you know oh so little about which just whets your appetite all the more for finding out the details of how they wound up in this predicament. Gosling plays the Driver. Yep, that's the only name you know him by. He's a garage mechanic. He does stunt driving for the movies. And, for a price, he will be a getaway driver. No questions asked. He doesn't carry a gun; he just drives. He gives you 5 minutes to do whatever it is you want to do then he drives you away. - I couldn't help thinking of The Transporter. A slightly different premise but still the idea of a driver for hire. Of course, as with anybody involved with skirting the law, the Driver soon runs into the bad guys doing really bad things, like bad things to him and we get to see just how bad our hero can be. The strong silent type can also be the violent type and I mean violent. While the camera did turn away, I was wondering just what the human face would look like after being stomped on, oh, ten times or so. I can't be sure, but I had the impression the car chase scenes and crashes were real as opposed to special effects. Of course, who knows for sure these days? I do have to point out the problem of continuity in any film or is it a question of realism? In one scene, Gosling hits another car broadside knocking it over a thirty foot cliff. After we watch the car tumble down, we turn back to Gosling and there is his car with both headlights on and what looks to be a front bumper with no damage. The comedian Albert Brooks has a role in the film as a mobster. Nothing funny here as Brooks plays this straight and does a convincing job as somebody who wouldn't think twice about slitting your throat. While I would say the film is good, I have to temper that by adding good for its genre of nameless antihero goes badass on the bad guys. I didn't think it was truly original in terms of other films like Bullitt. It's odd that Rotten Tomatoes gave in 92% and Roger Ebert accorded it three and a half stars out of four while Cinema Clock in Toronto shows the film only garnered 6.6 out of 10 from its viewers. My recommendation would be to wait until this comes out as a rental. If you want to see a really, really good film, and let's not forget you're forking over a chunk of change these days to see a film at the theatre, I'd be tempted to recommend something else. But that's just me. 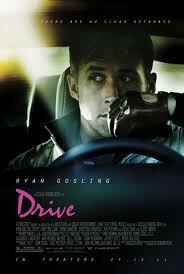 A hyper-stylized blend of striking imagery and violence, Drive represents a fully realized vision of arthouse action. Drive is a 2011 American action drama film directed by Nicolas Winding Refn that is adapted from James Sallis's 2005 novel of the same name. After an unsuccessful attempt to create a film adaption made by Universal Studios, this project was greenlit in early 2010. When Ryan Gosling, who plays the unnamed principal character, signed on, he was allowed to choose the director. A fan of his work, the actor chose Refn. Before filming began towards the end of 2010, Carey Mulligan, Ron Perlman, Bryan Cranston, and Christina Hendricks joined the cast.